Could Help TURBO-CHARGE Your Mind! This Is The Program THEY TRIED TO BAN! A control panel that can enabled you to learn from some of the GREATEST people to ever live on earth... simply by KNOWING how to access the inner mind! The best part is, WE ALL have this awesome power within our own minds. What if there was a way to activate our brains almost like a switch? If you want help experiencing self-confidence, just CLICK that switch. If you want motivation to help lose a few inches from your waist, just CLICK that switch. If you want help for your fear of public speaking, just CLICK that switch. Wouldn't that be a much easier method of working with your mind? Of course it would. But unfortunately the brain doesn't come with its own control panel. And that's why we tried to build one! My name is Bradley Thompson. Back in 1999, I and a small team of programmers helped to produce one of the first subliminal messaging software. It was called Subliminal Power - and it flashed positive affirmations on your computer screen while you worked. And WOW - we all agreed it was powerful! Subliminal Power seemed to be the SECRET control panel of the brain! In fact, it was SO powerful that our customers told their friends. And their friends told even more friends. Today, over 1 Million people use Subliminal Power worldwide. And they're STILL spreading the word. Our customers range from self-development gurus to Olympic Gold Medalists, from software giant Microsoft to the US Army. Just click here to read a few of our testimonials. Are YOU still wondering why Subliminal Power enjoys such a huge following? EASY. Because people see that it WORKS for THEM. Subliminal Power enables a unique way to help you in many areas of your life. There's absolutely NO psychotherapy. NO hypnosis. NO meditation. NO reading. NO magic spells. It's easy to setup too. Just install Subliminal Power once and select a "subliminal program." Want help losing weight? Choose that program. Want help increasing your IQ? Choose that program. Just turn it on and Subliminal Power will begin flashing its unobtrusive messages -- and literally starts to help you REPROGRAM your mind helping to achieve with the power of positive subconscious messages. And the Powerful Leaders That RECOMMEND Subliminals! WHAT? Yes it's true......It was back in the 1970's that I first stumbled upon the world of subliminal messaging. ... You see, that was when the US Government tried to BAN IT! Maybe you remember. Advertisers had tapped into the secret CIA research in 1950's public movie theaters, and the studies of Wilson Bryan Key, Vance Packard, and Eldon Taylor of the 1960's. They were beginning to realize: Subliminals can SERIOUSLY influence your mind! Of course advertisers had an ulterior motive. They wanted your CASH. There was a lot of hype and the public soon forgot the hysteria. And subliminal messaging was NOT banned. Today, however, people are beginning to realize JUST HOW POWERFUL this technique can be. Subliminal messaging has been popularized by success coaches such as Anthony Robbins, mentalists such as Derren Brown and world-leading sport players, such as Tiger Woods. It's proven by science. It's the future of the mind. But WHAT exactly IS subliminal messaging? Subliminal messages are positive affirmations sent DIRECTLY to the subconscious mind, bypassing the more critical thinking conscious mind. The subconscious then follows these commands to produce POWERFUL and EXCITING positive stimulation. Subliminal Power works by flashing positive affirmations around your computer screen while you work. The messages are completely unobtrusive. In fact, you probably won't even notice most of them. But the subconscious does. It soaks up every single message - Customized to your desires. "You will ALWAYS remember the day you installed Subliminal Power!" And CUSTOMIZE It For Virtually Any Area Of Your Life. You Can Even Set It To Turbo-Charge Your Favorite Sport! Henry Ford famously said: "Whether you think that you can, or that you can't, you are usually right." We're only limited by our thoughts. And when you can REPROGRAM your thoughts at the DEEPEST POSSIBLE LEVEL, you can unlock your hidden potential for AMAZING things. Do you get the feeling that SOUNDS RIGHT to you? Olympian winner Ruben Gonzalez wrote to me just last week to send his PERSONAL PRAISE for Subliminal Power. And embarrassingly, I never even knew he used the program! He used Subliminal Power to IMPROVE his sport and WIN the Olympics. Not once - but THREE times. 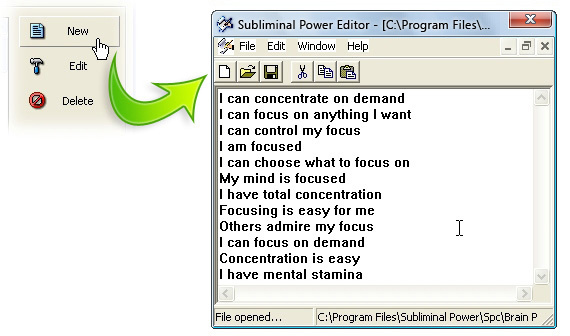 that MAY just convince you to grab Subliminal Power - NOW! That isn't a unique story either (heck, I didn't even know he was a customer!). I invite you to CLICK HERE and read through our testimonials page and discover just how people are putting Subliminal Power to work! Subliminal Power Must Be Complicated... NO WAY! It’s Very Simple To Set-up & Use Even For Newbie PC Users! AND HERE'S HOW... ARE YOU READY? STEP ONE: Select Your Subliminal Programs! 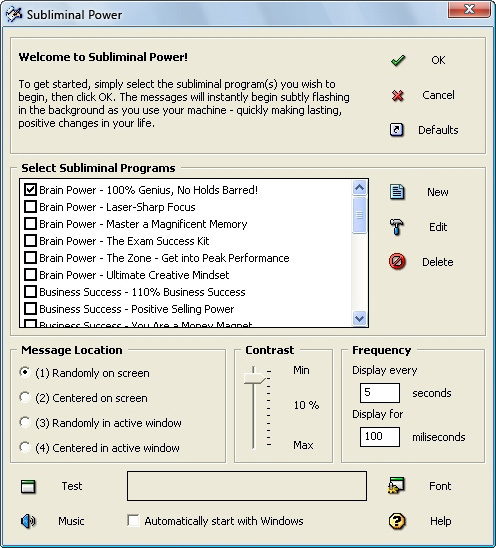 Once you've installed Subliminal Power, simply tick the subliminal programs you'd like to run. Want to help improve public speaking? Then tick that subliminal program. Want help developing your skills in the bedroom? Just tick that subliminal program. Want help increasing your IQ and brain power? Tick the subliminal program. Can't find a subliminal program that suits you? That's near impossible. We've created a BONUS add-on CD containing over 120 subliminal programs, with a collective total of OVER 1500 AFFIRMATIONS. then simply CREATE your OWN subliminal program! STEP TWO: Click OK and Let Subliminal Power Get to Work! It hardly even warrants a step of its own. Just click OK and let Subliminal Power minimize to the task bar. It'll immediately begin flashing subtle, unobtrusive messages around your computer screen while you work. You'll probably never even notice them working the subconscious mind. STEP THREE: Remember the Day You Installed Subliminal Power! You'll see why so many people LOVE this software program! Here's My 100% MONEY BACK GUARANTEE! I want to tell you that I'm VERY EXCITED to be able to offer you this new Subliminal Power package. We've come on so much since the early days back in 1999. There has literally NEVER been a better time to try out Subliminal Power and get your hands on this powerful tool. I'M SO POSITIVE that you will be totally thrilled, I'm giving EVERY SINGLE CUSTOMER the chance to try out Subliminal Power for a whole 28 days! If you're not ABSOLUTELY AMAZED and HAVEN'T recommended Subliminal Power to your friends within those 28 days, simply let us know... and we'll refund EVERY SINGLE CENT. There's NO small print and there are NO questions asked. It's a TOTAL SATISFACTION GUARANTEE. And the total cost for all of this is less than the price of a decent meal for two. When you download today, you'll receive ALL of the above at the tiny price of just $39.95. here's the price BIG and BOLD: $39.95! Why I'm NOT Trying to Sell Subliminal Power to You! -- Here's How to Grab YOUR Copy Within FIVE MINUTES! I want you to know that I'm NOT here to sell Subliminal Power to you. You see, I know that if Subliminal Power is right for you - you'll purchase it. There's an old Chinese proverb that I really live by, each and every day. It says that: "When the student is ready, the teacher will appear." So if you get even a remote feeling that this might be the magical bullet you've been looking for, then I'd really like to invite you to TAKE ACTION. Click on the purchase link below to grab your copy. You can order via credit card, online or over the telephone. You can even pay via PayPal. And if you pay online, your order will be completed in just seconds -- and you'll receive your download links INSTANTLY! Within a few minutes - As you work on your PC! Access details will be delivered via email immediately after purchase! You can pay securely over the Internet using Visa, Mastercard. "You'll always remember the day you installed Subliminal Power!" is perhaps my favorite phrase. I hear so many people saying it these days, and it makes me smile every single time. And I'd really like to hope that YOU'LL be saying it too -- in just a couple of short weeks. Rather than remaining stuck, remembering the day you DIDN'T install Subliminal Power. Life isn't about regrets. It's about seizing opportunity. Founder of Subliminal Power, The SelfDevelopment.net Network. PS. There really has NEVER been a better time to try Subliminal Power! Not only have we JUST released our brand new version -- we're ALSO considering increasing the price in May to $99.95 per copy. By grabbing your copy now, you'll get the ENTIRE program, FREE lifetime updates (sorry, I forgot to mention that in my letter! ), FREE lifetime support, 22 FREE subliminal programs, FREE classical music files and more. There's NEVER been a better time to kick-start your self-growth. Click HERE! PPS. Subliminal Power is ONLY available from THIS Web site! Subliminal Power is THE original subliminal messaging software. Cheap imitations OFTEN appear on the market, full of software bugs and flawed subliminal messages. It's your BRAIN - BE CAREFUL what you feed it. We are the ONLY site that sells the all-original Subliminal Power software tool. Click HERE to grab YOUR copy - TODAY! MEDICAL DISCLAIMER: Subliminal Power is not intended to diagnose, treat, cure, or prevent any disease. Product uses flashing images. Do not use if you are susceptible to health problems due to flashing images.